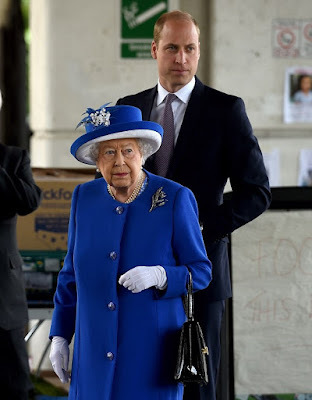 The Queen and grandson Prince William were met with applause when they dropped in to an emergency shelter in West London this morning to meet the devastated survivors of the Grenfell Tower disaster. 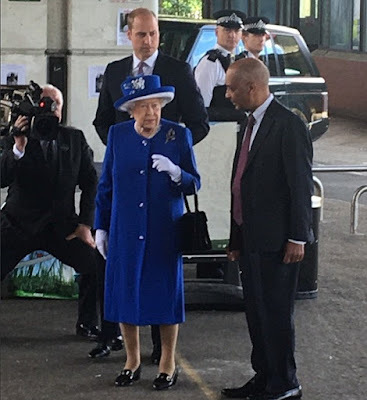 Her Majesty The Queen, accompanied by HRH The Duke of Cambridge, visited the Westway Sports Centre in White City - a venue that has been a focal point for efforts to support those affected by the deadly inferno inside the high rise. The royal visitors are expected to meet volunteers, local residents and community representatives while visiting the centre which is in the shadow of the charred remains of the building in west London. On Thursday the Queen paid tribute to the 'bravery' of firefighters who battled the fire and praised the 'incredible generosity' of volunteers offering their support. 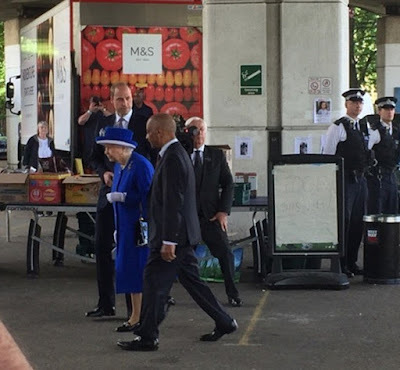 Queen Elizabeth II arrived at the centre wearing a blue outfit and matching hat as she talked solemnly with volunteers and officials. She was flanked by Prince William in a suit and both headed inside the centre having mingled with those stood outside. In a statement released by Buckingham Palace, the Queen said she and her husband, Prince Philip, wanted pay tribute to members of the emergency services who risked their own lives to save others. And she said it was 'heartening' to see the way people had rallied around those affected. It read: 'My thoughts and prayers are with those families who have lost loved ones in the Grenfell Tower fire and the many people who are still critically ill in hospital. 'Prince Philip and I would like to pay tribute to the bravery of firefighters and other emergency services officers who put their own lives at risk to save others.